One night coming home from work last week I was taken aback by the beauty of the moon rise. It was so amazing to see the clouds that were sneaking in to cover parts of it. I so wanted to capture it and share it. The way the clouds moved back and forth covering the moon and then not was like a magical show of nature. The colors of the night were like a blanket covering night sky and snow-cover lands alike. it was almost indecipherable where the sky ended and the horizon started. The color was a blue of melancholy, sadness, loneliness and yet so peaceful. I talked myself out of stopping my truck and taking a picture until I was nearly home. The reasons were many for not taking the picture. It was approaching night so the light wasn’t good, but that is what made the sight so special. I didn’t have the right set up to take the photo, I had just a phone. The picture wasn’t framed right and there were things in the picture I really didn’t want. It was bitter cold and I was dressed to commute, not stand outside for an extended period of time. Dinner was waiting. The list in my mind was a mile long as I continued to look at that moon and watching the changing images as the clouds moved in and out. I recently started a new creative set of classes for 2017 and my statement his year is: Change the Pattern of Your Life. It hit me. I was letting the same pattern of excuses make me not take a chance and see what would happen. When I was just a 1/4-mile from home I finally I just got out and took a half dozen shots. None of them will make National Geographic, but I did it. It doesn’t capture the sight as I saw it, but it still serves as a medium to share something of that night with others. I did not let the pattern of letting the same reasons for not doing something continue to drive me and prevent me from trying. Do you let a very repeatable list of reasons prevent you from trying something? Does your selftalk sound like a parrot repeating the words over and over? When was the reason you tell yourself for not trying something a new reason, not the same reason you told yourself 100 times over? Challenge yourself to explore, do something that those comfortable reasons say not to. Don’t let the pattern of your life prevent you from living it. If you are interested in the class I am taking samples of my creative work and information on the class can be found about it on my other blog Playing Without Limits. Our dog, Zip, has been full of challenges. Most of them come from his previous life as a puppy companion to an older woman. He ended up in the shelter when the woman could no longer stay in her home and family could not keep her dear pets. Zip loves laying in the lush grass over the septic field. Read between the lines, and you know what things Zip never learned. Zip’s main purpose in life was to sit on her owner’s lap and be the center of her world. We suspect his owner wasn’t very mobile and because of that he wasn’t house trained until he learned it here. He had never experienced grass before us. To this day he likes to walk and lay in lush Iowa green grass and hates prickly cured Montana dry grasses. He isn’t crazy about snow and absolutely hates rain. He can hold it for hours rather than go outside in even a light drizzle. We have learned that we just pick him up and carry him out to a spot because he likely will never choose to go outside instead he will explode. He will go on walks, but he is the first dog that we have had that is not passionate about them. He is not a dog who loves to train with me or gets me out when I don’t want to go. We don’t tell him this out loud, but we think he is a pansy dog. He hates walking through even a little water on the road. Today he fooled us. His terrier instinct kicked in and he was on the hunt for some ground burrowing animal that has turned up in our yard. We have not see what is making all these holes, but Zip was out there in the hottest sun of the day digging for all he was worth. He was dirty from digging with his front feet and tossing with his rear feet. His feet were digging through not only soil but also rocks and roots. Some how I imagine that was harder on his feet than the dry grass. His head was down in the hole, snorting in a highly unimaginable fashion before today. His nose was mud caked from sniffing out his imagined prey. It was fun to see him having fun doing something outside. This is fun and I know how to do it. How’d I know how to do this, my humans have not tried to teach me this? So we now ask ourselves nature or nurture? When does it kick in? It was fun to see him enjoying himself doing something so dog. Yesterday as twilight settled in four bluebird fledglings showed up on our deck. They had feathered out enough that they could fly, but still had lots of baby down on their bodies. RangerSir and I watched them huddle and jockey around on the railing. Though they were from the same clutch it was interesting to see that they were not all the same size. Some had obviously been at the front of the food line more often that some of its siblings. In all the years of having bluebird boxes on the fence post, this was the most up close and personal we had ever experienced. I pulled my phone out and snapped some pictures, my favorite was when mom showed up with a tasty morsel. Fox as a symbol for recycling?!#? 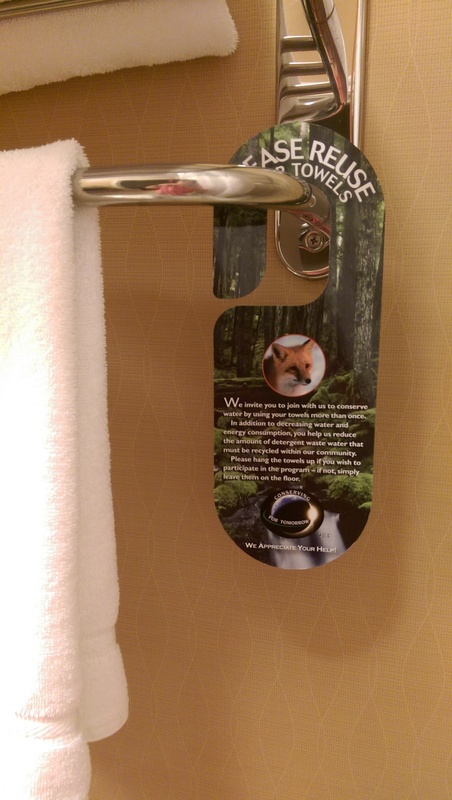 In my hotel, last week, there was a hang tag with a fox on it to encourage recycling. Really?!? Using a predator to encourage recycling what was the ad company thinking when they made this?? Have we gotten so far away from nature that people do not know that a fox is not some warm fuzzy animal. I know that right now I am a little tainted in my view of foxes, but seriously I think that they could have found some cute “nice” animal like a rabbit or fawn. Some sort of “helpless” creature that needs our help. A fox for the most part is smart enough to take care of itself. Timing is everything. This well-intended, well-placed reminder caused shake my head in wonder. Not the good kind of wonder either. This morning just before the sun peeked over the Eastern rise I was laying in bed listening to the birds start to wake up and begin to sing their morning songs. In those early moments of solitude listening to the birds working towards a crescendo, I suddenly heard a different song, the song of the coyote. We have a coyotes who live and travel behind our place. I have seen tracks and other evidence of their presence, but seldom hear them and have only once seen them. This morning their song bounced all around, echoing off the gentle rolling hills and deep valleys behind our home. It made them sound like they were all around. As I lay there listening, I wondered what does a coyote karaoke party look like. Do they all lift their heads and sing at once in three-part harmony? Or is it some kind of “smack down,” where when one stops another picks up trying to top the last coyote? There are cow-calf pairs in the rangeland behind us. Had they just found dinner and the song was that of their celebration and calling the rest of their family in for a feast? Hours later as I reflect on this, I am still not sure what kind of song was being sung. The song of the coyote always feels to me a sort of eerie sort of tune. I liken it to listening to the opera, enjoying that which your ear hears but not sure if you should be enjoying it all. Are they singing about something joyous or do those words tell a sad tale that would bring a tear to your eye? Only the family of coyotes know the answer to this question. Spring comes late to the high country. 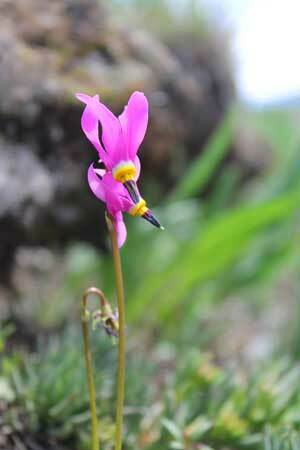 Today we took an afternoon drive and got to see some of the mountain wildflowers. One of my favorites is the shooting star.